More than 47 million Americans receiving Social Security will get a 2.7 percent increase — an extra $25, on average — in their monthly checks next year, but much of the increase will be eaten up by higher Medicare premiums. The Social Security Administration announced the cost-of-living adjustment Tuesday, and the increase will start showing up in checks in January. 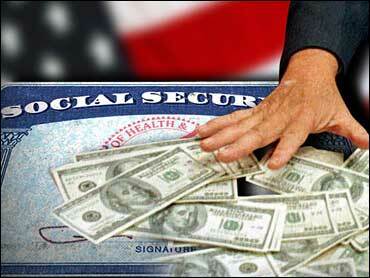 The latest increase was the largest since benefits rose by 3.5 percent in 2001. A 2.1 percent increase went into effect at the beginning of this year. The annual cost of living adjustment, or COLA, is based on the rise in the government's Consumer Price Index from the July-September quarter of last year through the third quarter of this year. The $25 will mean that the monthly check for the average Social Security retiree will rise from $930 this year to $955 next year. However, the average retiree will only see a little over half of that increase because the government announced last month that monthly Medicare premiums for doctor visits are going up by $11.60 a month next year, a record in dollar terms. Under law, no Social Security beneficiary will get lower benefits than that person is currently getting even if their Social Security cost-of-living adjustment does not cover the entire cost of the Medicare premium increase. But advocates for the elderly said that protection still means that millions of Social Security beneficiaries at the low-end of the benefit scale will see no gain at all this year because the COLA increase will all be eaten up by the Medicare premium increase. "That means that many people will have no ability to keep up with inflation," said John Rother, policy director at AARP, formerly the American Association of Retired Persons. Rother and other private economists said another problem is that the COLA will not cover the big jump in heating costs many Americans are expected to see this winter, reflecting crude oil prices that have climbed to an all-time high above $50 per barrel. "Unless energy prices come down soon, it is going to be a tough winter for lower income households and seniors," said Mark Zandi, chief economist at Econom.com. "Many people may have to decide between buying Christmas presents and paying their heating bill." However, a government report out Tuesday showed consumer prices rose by a modest 0.2 percent in September as a decline in prices for new cars and airline fares helped to temper a rise in costs for medical care, gasoline and fuel oil. Social Security, a New Deal program launched in 1935 to abate deep poverty among seniors during the Great Depression, paid nearly $400 billion in benefits last year. The program pays benefits to retirees funded through payroll taxes. For most of its history, the program has collected more in taxes than it paid out in benefits. The surplus money has been kept in a trust fund, and lent to the federal government to cover budget deficits. Social Security will face a funding shortfall beginning in 2018 as the demands of baby boomer retirements mean that the program will be paying out more in benefit checks than it is collecting in from current workers. That means the program will have to tap into its trust fund, meaning the federal government must pay back the money it has borrowed, which will strain the regular government budget. Eventually, even the trust fund will be depleted. Proposals to head off insolvency include trimming benefits, raising the retirement age, changing the payroll tax system or allowing workers to invest more on their own. Federal Reserve Chairman Alan Greenspan said in August that the country will face "abrupt and painful" choices if Congress does not move quickly to trim the Social Security and Medicare benefits that have been promised to the baby boom generation. "As a nation, we owe it to our retirees to promise only the benefits that can be delivered," Greenspan said. The approaching demographic crunch makes Social Security a hot issue on the campaign trail. In the closing days of the presidential race, Democratic challenger Sen. John Kerry is accusing President Bush of planning a surprise second-term effort to privatize Social Security, saying such a move would be a "disaster for America's middle class." Kerry pointed to a Sunday New York Times Magazine story that quoted Mr. Bush as telling supporters that "privatizing Social Security" would be high on his second-term agenda. Kerry promised "I will never privatize Social Security." The reaction from the Bush campaign was to call the published report "flat inaccurate." "The seniors will continue to get their checks," Mr. Bush told the Associated Press in an AP interview. "It is wrong to try to scare people going into the polls." While Mr. Bush campaigned in 2000 on a program to partially privatize Social Security by giving younger workers the option of diverting some of their payroll taxes into private investment accounts, he has never pushed the proposal in Congress, in large part because of the sizable transition costs that some estimate would top $1 trillion. Those costs occur because the money that younger workers pay into Social Security is used to pay benefits to current retirees. If some of workers' taxes are diverted to private investment accounts, a shortfall will occur.